2009 August archive | YORK BLVD. Were you surprised at the huge reaction against your ordinance cracking down on illegally parked taco trucks? Absolutely. The people who made it kind of a gag almost certainly don’t know any of the issues. I had a taco truck in front of a school — they wouldn’t move, they just paid the citations and parents complained they were crossing with their children and couldn’t see around them. I had no ability to move it out of there. We spent a lot of years negotiating — “Come on, guys, move on” — and they wouldn’t do it. I remember getting a letter from someone in West Covina who said, “What is wrong with you? There’s nothing better than going into East L.A. and having these wonderful tacos.” [These] weren’t people who had these trucks in their neighborhoods. Why is it they don’t have them in Pasadena on Colorado Boulevard? Because they don’t permit it. I’ve had good meetings with the loncheros and said, “I’m not trying to ruin your business.” [But some operators are] urinating on lawns, making noise, they’re there until 2 or 3 in the morning. This comment needs to be addressed because we can’t allow Supervisor Molina to portray this issue in hindsight as one of privileged out-of-towners slumming it in East L.A. without regard to the health of local children. The opposition for her legislation began in her district among her constituents. Furthermore, her characterization of our efforts as a “gag” is not nearly as troubling as minimizing the hundreds of families she was putting out of work. It’s a shame that Supervisor Molina is preying on emotion by making this an issue about child safety when the debate is ultimately one of economics. She attempted to please a well-organized group of moneyed businesses by pushing out a competing group of individuals with less money and even less influence. There is an honest economic discussion to be had here, but the introduction of children into the debate is a shameful scare tactic. Fortunately, the loncheros have legal council from the UCLA Labor Center and have organized into a lobbying association, which will make it harder for them to be the prey of Big Taco. Supervisor Molina can call us whatever she wants (“blogosphere alarmists” comes to mind), but like it or not, the loncheros have become a special interest that Southern California politicians would be fools to ignore. I’m going to forgo any playful puns with the word “super” and even resist the great temptation to cite Chris Farley’s classic El Niño skit. Joke temptations aside, El Super opened its doors on the former site of Big Lots (and before that a Safeway), despite some neighborhood vitriol surrounding an attempt at preserving the original building’s facade. 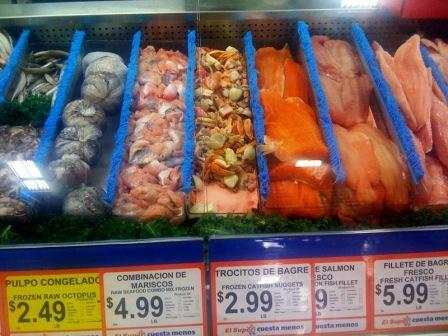 Protestations aside, El Super is well…just another Hispanic grocery store. 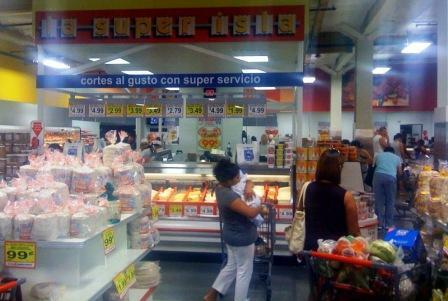 Smaller than nearby competitor Super A, El Super’s layout is very similar to El Superior on Figueroa and Avenue 45. (I wonder if Spanish speakers are surprised to find out how many words we have in English that mean super, kind of like Inuit words for “snow” or Greek words for “love”?) Anyhow, the most noticeable part of the experience of shopping at El Super is how completely tailored it is for the Spanish-speaking consumer as very few signs are in English. To quell some neighborhood concerns, both El Super and Super A employees are part of the local UFCW. Other than some trucks narrowing traffic to a single lane on Nolden St., there doesn’t seem to be much worth noting other than the meatballs: They’re clearly made for albondigas soup and will need garlic and salt if you want to use them in pasta. The LAPD’s crackdown on some of the more upscale trucks on the Miracle Mile portion of Wilshire last week is resurrecting fears that law enforcement is still willing to find any excuse to hassle food trucks at the behest of competing restaurants. We mentioned the Green Truck’s plight on the Westside in this post and the LA Times wrote another piece on the 23rd specific to the Miracle Mile incident. 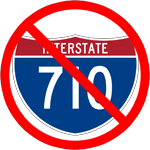 An online petition is circulating (we didn’t start it this time…I promise) with the hopes of expressing customers’ anger at having their options limited due to picky parking tickets. Do your civic good deed for the weekend and hopefully law enforcement can start enforcing laws that affect us, rather than the bottom line of Big Taco.